The Royal Academy of Arts in London held a spectacular RA Late event on December 9th 2017 to celebrate all things surrealist and Dada. Experiencing the worlds of Salvador Dalí and Marcel Duchamp for one unforgettable night recreating 1930s Paris; visitors enjoyed a decadent surrealist ball, a Dada karaoke, optical illusions and Dali’s dreamscapes brought to life. 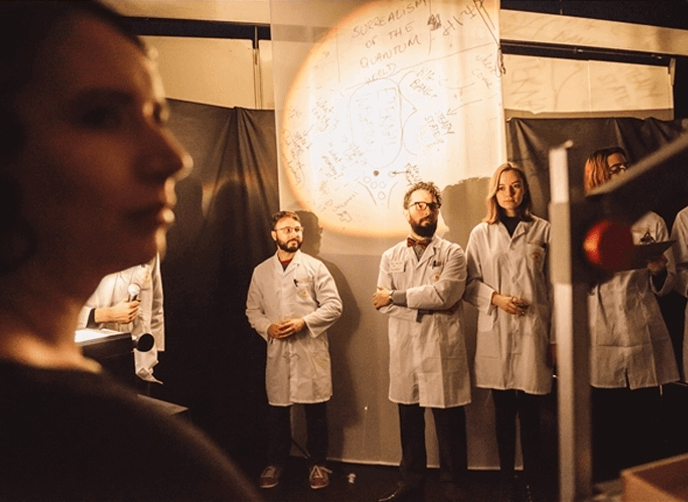 The site-specific installation and performance ‘L’Observatoire Bizarre’ was a collaboration between MA students of the Royal College of Art and UCL’s Astrophysics Department. The Royal Academy’s Learning Studio was transformed for the event with black Harlequin Cascade specialist flooring creating a world of projection, surrealism and imagination.